Sure, you could do as the old saying suggests and make lemonade, but why stop there? Lemon wedges are totally the way to go. Besides being convenient and versatile, they have the added benefit of being a delicious ingredient in many an adult beverage. Save the lemonade for the kiddies, and give life a kick right back in the pucker. 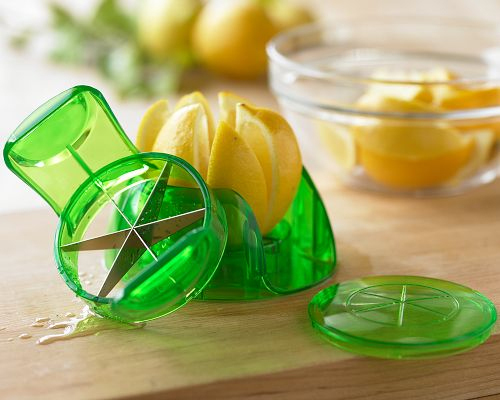 Easily slice and divide lemons and other citrus fruit into uniform slices with the Citrus Wedger from Williams-Sonoma. Accommodating fruits up to 2.75-inches in diameter, the kitchen gadget creates six wedges with one simple motion. No matter how many lemons you may have hanging around, a handy device such as this makes prepping them that much easier. UPDATE 6/30/12: The link from Williams-Sonoma no longer works, so check out the Norpro Lemon Lime Slicer instead. Four-and-a-half stars and less than ten bucks!